The quirks and perks behind the scenes at Houston’s Johnson Space Center, including NASA's own "air hockey table." NASA is inarguably one of the most most familiar, iconic aspects of Houston, yet foreign and seemingly far away at the same time. We know NASA is all about that space, but how exactly do they go about exploring the great unknown? Plenty of Houstonians have taken NASA's tour of the Johnson Space Center in Nassau Bay and gained a few glimpses of the inner workings at the nation's space agency, but that tour barely scratches the surface of what actually goes on. So what aren't you seeing on that tram tour? We gained exclusive access to a few off-tour sites not often seen by the general public, and we're bringing you along on our own behind-the-scenes peek at the murals, jetpacks and adult diapers that you won't encounter at Space Center Houston. JSC is the primary center for spacecraft design, development, mission integration and crew training. Many Houstonians may be familiar with Building 9, the Space Vehicle Mockup Facility, from the catwalk high above overlooking the International Space Station parts and Orion Capsule. But what’s it like inside those parts and past the Special Authorization Needed signs? 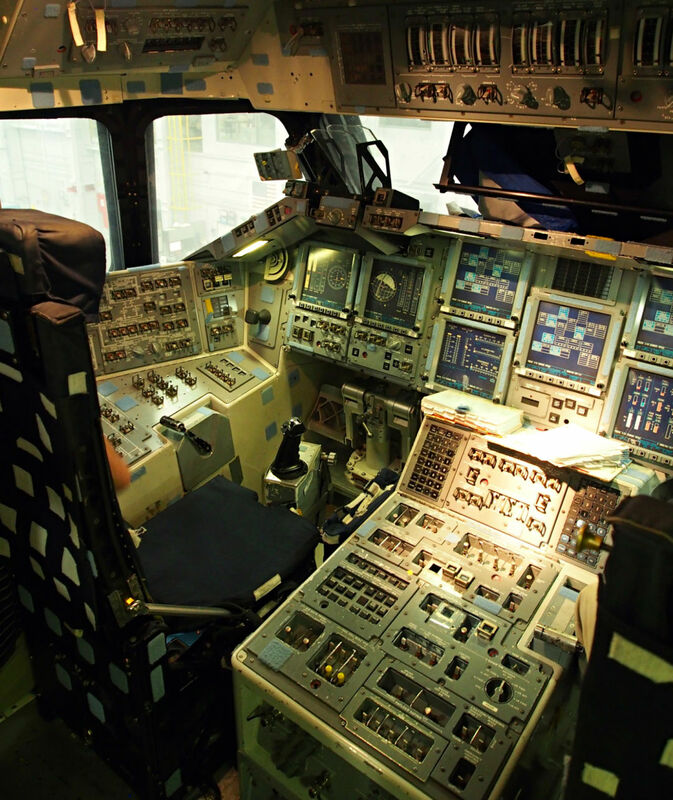 Think you could handle all the buttons that the shuttle mission Commander works with? 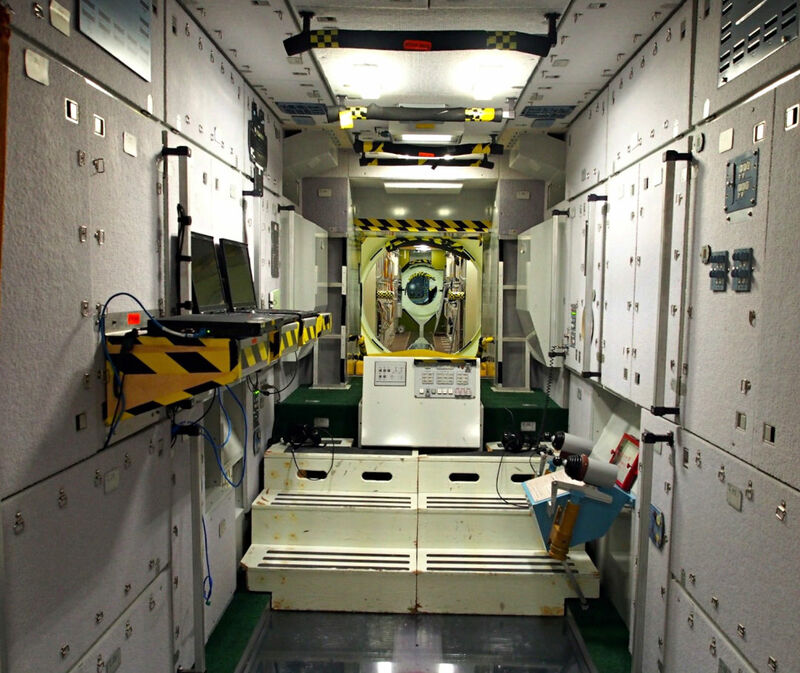 This is where astronauts come to practice evacuation protocols and emergency bailout training. There are essentially two very cramped levels—the bottom level was stuffed with the supplies needed for space travel like food, medicine, tools, beds, toilet, research and clothes, while the top was all about cruise control. Buttons cover the walls and dash so the Mission Commander and pilot often had to use mirrors to be able to see them all without having to turn their heads this way and that. That being said, many of the buttons were labeled to account for this—meaning they were written backwards so the mirror would reflect the spelling correctly. Up in space, daily routines take a turn. In the Russian Space Station, astronauts use bags instead of toilets when nature calls. The problem with this imperfect system is that sometimes the bags aren’t tied properly—and when that happens, certain things can go adrift. On the other hand, the fun part about no gravity is that mealtimes become a free-for-all as food floats about the tiny table and is snagged by hungry hands. Half the time, you’re just grabbing whatever catches the corner of your eye and stuffing it into your mouth. The not so fun part, according to NASA lore, is a story that maintains while the Russians were eating dinner in space, one astronaut mistook a floating piece of bread for a piece of… Well, you catch the drift. Of course, it’s not really an air hockey table, but it's the same concept. Picture a massive floor that pushes enough air out to move a 500-pound box with a slight push. Since there’s no friction on the ground, it’s used to mimic momentum in space. Problem is, it’s a lot harder to stop a 500-pound box unencumbered by friction than it is to push it. 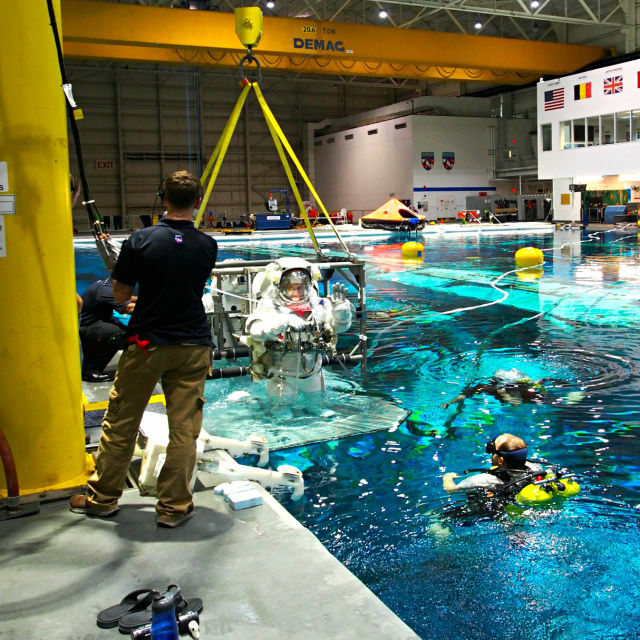 The NBL consists of a giant 40-foot-deep pool large enough to fit a full mock-up of the outside of the International Space Station with a working giant robotic arm just like the one in space. 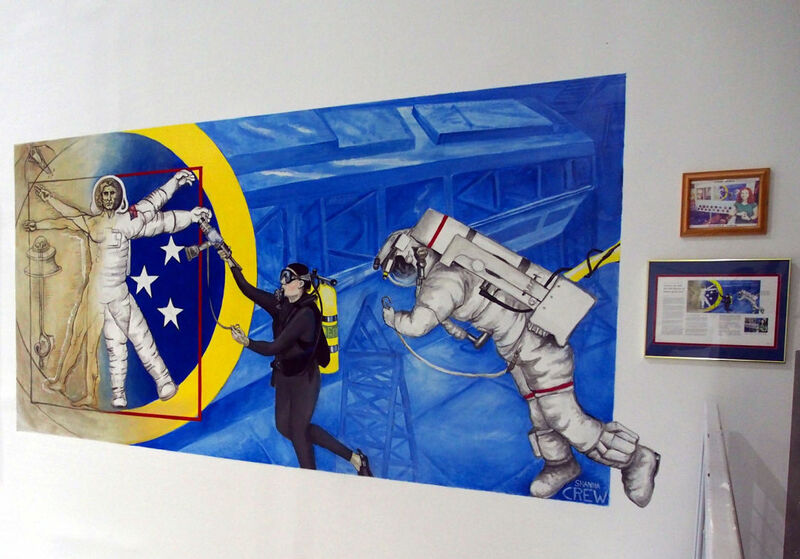 It also includes a couple of space-themed murals painted by one of the divers themselves who went on to become an artist, proving that diving isn’t the only thing they specialize in. 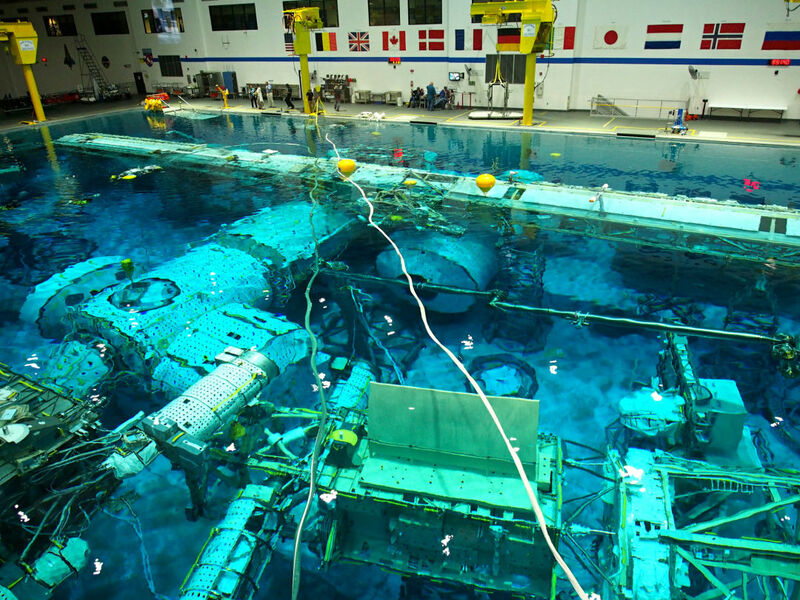 The NBL is where the astronauts do their extravehicular activity (EVA) spacewalk training and, in the old days, was where they'd also play a little bit of water polo to blow off some steam. The term "neutral buoyancy" comes from the fact that the divers have an equal tendency to float as they do sink. Basically, articles that are made to be neutrally buoyant through a combination of weights and flotation devices seem to “hover” under water, much like an astronaut would in space. While neutral buoyancy doesn’t exactly imitate the lack of gravity in space, so far it’s the closest we’ve got (don't believe that old kids' tale about a zero-gravity room at NASA), and helps prepare the astronauts much more than they would be able to otherwise. 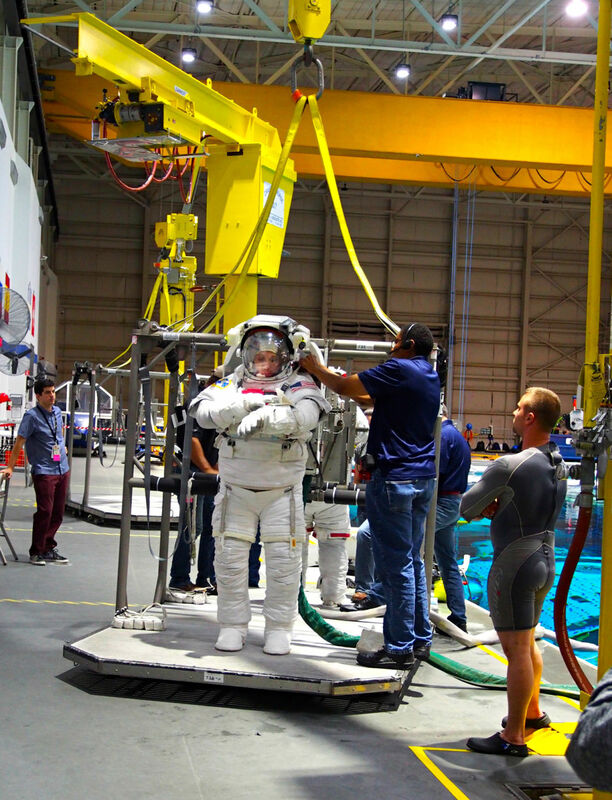 Astronaut suits can weigh over 100 lbs and consists of multiple layers and pieces of equipment. No wonder they take up to 45 minutes to get on. Girls, if you thought it was hard to shimmy into those skinny jeans from last fall, you can’t imagine how time-consuming and difficult it is for the astronauts to put on their suits. And yes, they are suited up in their spacesuits to get as close to the real thing as possible. It can take up to 45 minutes and four assistants to suit up, and that’s not accounting for any bumps along the way. Of course, safety is their biggest concern so if the suit isn’t ideal, they’ll spend another chunk of time locating and fixing the problem to make sure the suit is in perfect shape. Astronauts get bored at times, just like us. While the astronauts are being loaded up by weights and floats and gadgets and gismos, they have to patiently stand on the platform. Standing still for 45 minutes at a time can be a struggle, especially if the astronaut getting suited up behind you encounters a problem with their suit, and are forced to sit tight for another half hour. But they do find ways to preoccupy themselves; we watched one astronaut play with the end effector on his ballstack (yes, unfortunately that’s actually what it’s called)—a moveable, long arm attached near his waist that he would grab onto and zing this way and that. 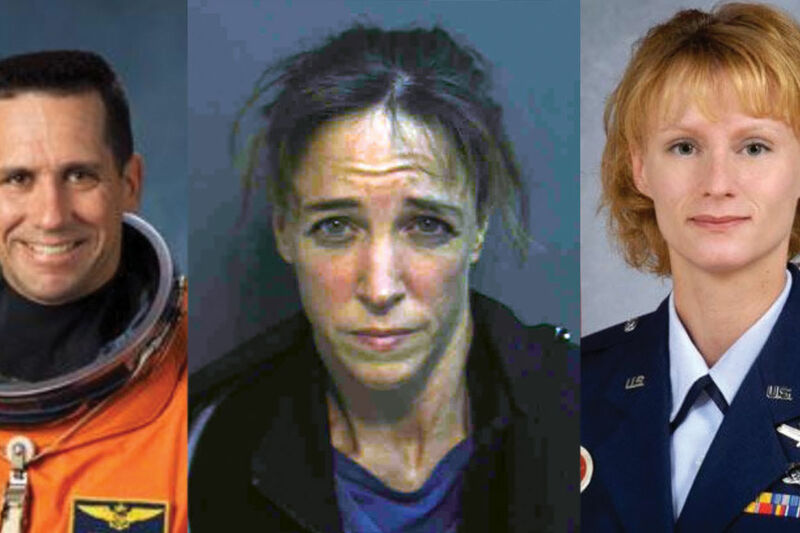 But that’s not to say these astronauts shouldn’t be taken with the utmost respect and seriousness. These guys and gals are the real deal. Astronauts are high maintenance. Just kidding. But really, although they’re really good at what they do, it couldn’t be done without a little help. They are accompanied by two safety divers, camera divers and one all-around diver to help with certain procedures and make sure that nothing goes wrong. Astronauts are pretty funny, too. Once they’re finally suited up properly and ready to go, a giant crane-like machine slowly lifts them up and sets them into the water. As they slowly descend, the astronauts will often wave to the crew or visitors and playfully splash the other divers around them. Forget the Fendi backpack, the divers carry backpacks worth $10 million that supply their air through an umbilical. They also wear a SAFER (simplified aid for EVA rescue), basically a jetpack that can fly. No big deal. Unfortunately, they only wear the real ones in space and use plastic replicas during the dive. The dive itself takes around six hours to replicate how their EVA will work when the astronauts do it in space. And in case you’re wondering how they can hold it in that long, they don’t have to because they have the most high-tech diapers you can find. Hey, when you gotta go, you gotta go. The evolution of space travel depicted by an artist-turned diver. Just out back behind the NBL you can find the Ellington Field, where T-38 fighter jets scream across the skies like bullets. Seriously, we were lucky enough to step outside just as a T-38 took off and the only thing I can compare it to is a giant bullet—unwavering and relentless. In order to become an astronaut, you have to learn how to fly one of these. Which isn’t too bad considering once They’ve got the hang of it, the astronauts often just hop in one and take it down to the Kennedy Space Center in Florida. That being said, living in south Houston you might hear a buzz in the air throughout the day, but don’t worry, those are just astronauts training in T-38 fighter jets. 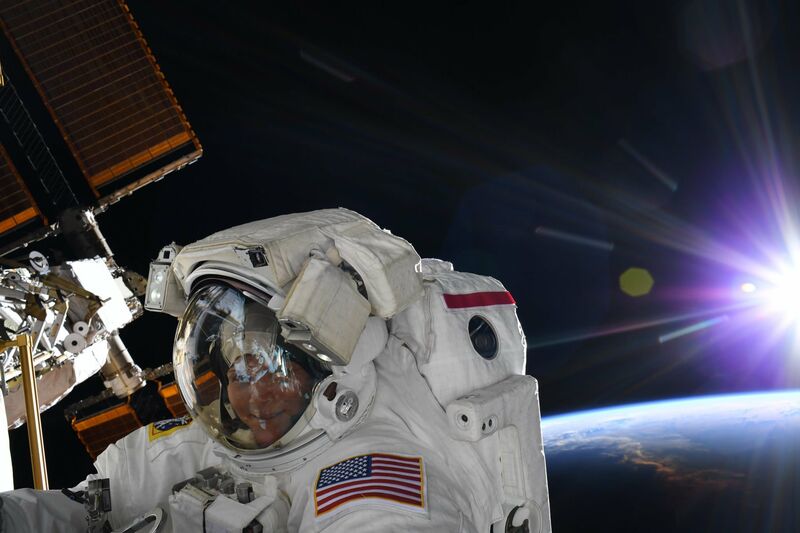 While this only skims the surface of all the interesting stuff that happens behind-the-scenes at NASA, hopefully this gives you a better sense of the funny and crazy things astronauts do on a daily basis, because yeah, they’re real people too. 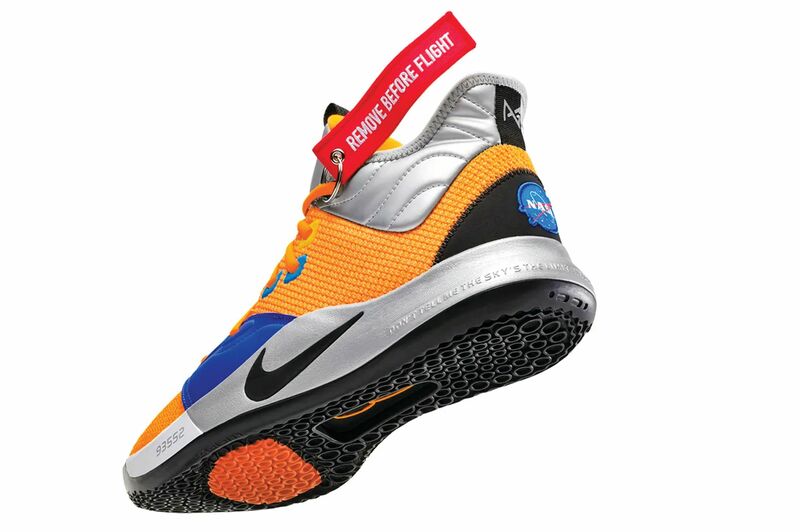 How NASA Are Nike's New NASA-Themed Sneakers? 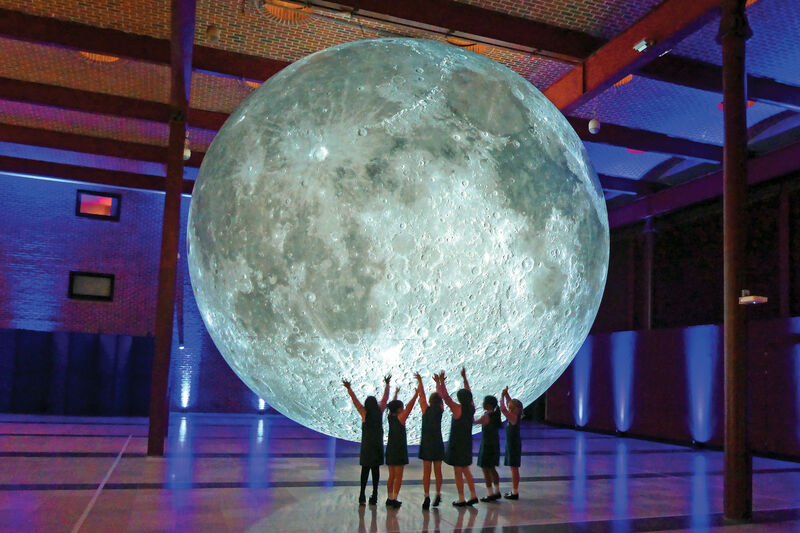 How Do You Honor the 50th Anniversary of the Moon Landing? With a Giant, Glowing Moon, of Course.